and PTO Belts > Dixie Chopper Lawn Mower Belts - High Quality OEM Replacement Belts > STENS 258-091 Belt. Stens True-Blue OEM replacement belt for BOBCAT 38234, DAYCO L591, DIXIE CHOPPER 2006B88W, GATES 6991, GOODYEAR 85910, WOODS 70003 Mower belt. 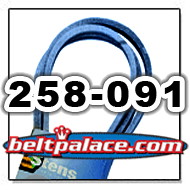 STENS 258-091 Belt. Stens True-Blue OEM replacement belt for BOBCAT 38234, DAYCO L591, DIXIE CHOPPER 2006B88W, GATES 6991, GOODYEAR 85910, WOODS 70003 Mower belt. STENS 258-091 Heavy Duty "True-Blue" Kevlar® wrapped replacement belt for BOBCAT 38234, DAYCO L591, DIXIE CHOPPER 2006B88W, GATES 6991, GOODYEAR 85910, WOODS 70003 Mower belt. Measures: 5/8” Top Width (.625 inch) x 91” Length. Engine to Deck mower belt. For use with DIXIE CHOPPER X2703-60, XG2703-60, XWF2700-60, XFG2700-60,SP2800-60, XT3300-60, LP3000-60, XXG2703-72,XT3300-72 deck drive belt. We offer 100% Secure Shopping!